I am so thrilled to introduce my first guest blogger, Angela over at Gluten Free in Georgia! She is one of my absolute favorite gluten free bloggers – very appealing, easy to read recipes that bring back many of the foods that I miss the most. 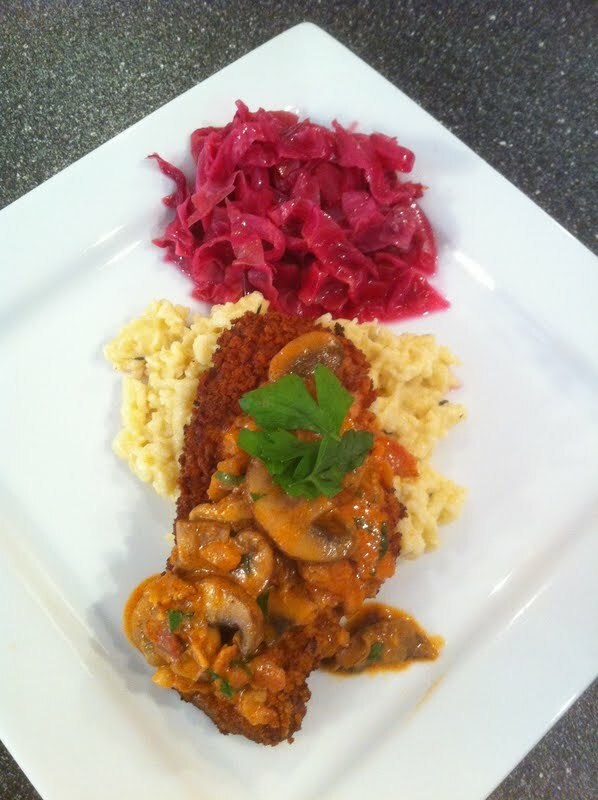 I cannot wait to try this unique gluten free recipe she has created for glutenvygirl followers: German Jagerschnitzel. I am so excited to share her post and recipe! Also, be sure to check out her recipe for German gluten free Black Forest Cake – the perfect accompaniment! You can subscribe to her (always-fantastic) recipes here. You can follow her on Facebook here. Also, check out her very interesting children’s book site here. I grew up in a military family which meant that we moved around pretty frequently. Every 2-3 years we would be stationed in another location so this always meant that I got used to being the new kid in school. One of the most interesting places we were stationed in while I was growing up was Germany. I still remember how friendly the German people were and I also remember the delicious food. I still prepare Bratwurst and German potato salad quite often, but this weekend I was craving something I hadn’t had in years….Jagerschnitzel. Don’t worry if you have trouble pronouncing it, but do yourself a favor and taste it. I am confident you will declare yourself an honorary German for the day. Season cutlets with salt and pepper while heating oil in skillet over medium-high heat. Dredge meat in beaten eggs and then coat evenly with bread crumbs. Fry for 1-2 minutes on each side until golden brown. Remove from pan and drain on paper towels. Keep the meat warm in the oven while you prepare the gravy. Saute bacon over medium-high heat for 2-3 minutes until starting to brown and then add your onions. Saute for 2-3 minutes more and then add tomato paste and mushrooms. Saute over low heat until mushrooms become tender and then add wine. Cook for 2 minutes and then add water and seasonings. Simmer gravy for 5 minutes and then stir in the sour cream. Spoon over your cutlets. I served mine with gluten-free spaetzle and German red cabbage. Posted in Guest Bloggers and tagged cooking, food, German, gluten free, Gluten Free in GA, guest blogger, Jagerschnitzel, pork cutlets, recipe. Bookmark the permalink.